"The Bad Haircut: A Disconnected Comedy"
Richard Boler's original new play, "The Bad Haircut: A Disconnected Comedy," debuts at the Renaissance Theatre Friday, July 12. 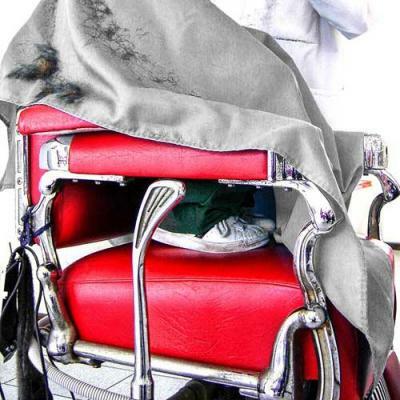 It starts with a haircut – a simple task of basic grooming most humans engage in every two to four weeks. But this isn't a typical haircut. It's a bad haircut. A really, really, really bad haircut. One so bad, the experience causes a guy to lose his sense of self. Such begins Richard Boler's original new play, "The Bad Haircut: A Disconnected Comedy," which debuts at the Renaissance Theatre Friday, July 12. So if Delilah can steal away Samson's strength by cutting his locks, it makes sense, in a Kafka-esque way, that in today's world someone can easily lose himself after a lowering of the ears. But what inspired the idea of the loss of identity by way of a haircut? "The idea I came up with is that we're suffering under a disconnection," says Boler, a smallish but spry 60-something guy with a salt-and-pepper crop, digging into the philosophical earth of his new comedy. "The heart of the play is modern life and disconnectedness," Boler says, over coffee on a Friday afternoon. "Every scene that I wrote started with me asking myself: 'What's the disconnection in this scene? Is a person disconnected from himself, are these people disconnected from each other, are these people disconnected from physical reality.' I wanted to know that there's some sort of disconnect so that it wasn't just a bunch of comedy sketches." Boler, a mental-health professional by day, writer by night, isn't a newcomer to writing, with columns appearing in local newspapers – including this one – and has seen his prose published in literary magazines. Although his work for the stage comes along at a more staggered, decades-long pace. "Apparently I write a play every 20 years," he says, bright-eyed and laughing, "starting at age 40." Boler's last play, "Spooks: The Haunting of the Skowronski Sisters," found success at the Roadhouse Theatre in 1991 when Boler first debuted his more traditional approach to comedy. The play drew a fan base throughout the '90s and even saw a run in Knoxville, Tenn. While "Haircut," like "Spooks," unfolds in two acts, the similarity ends there. "Haircut," after all, features the quest of a nameless protagonist and narrator attempting to find himself – on a non-linear path, a series of "interconnected sketches," Boler says. And this play explores the notion that something is very, very wrong in the world. "Because his identity is lost, he doesn't have a name," Boler says. "I like the idea of narration; I think theater is the telling of a story that comes alive. What started this story was the line of thinking: Something is wrong. Something is wrong with life. Something has happened. And we don't know what it is, but everybody kind of feels it on some kind of level. That was the impetus for me. "That's the way I've felt for maybe the last 20 years – certainly the last 15 years," Boler elaborates on "Haircut"'s genesis. "I thought it was just me – I thought I had just fallen off my horse and didn't know how to get back on. But then I started asking other people, 'Do you feel like something's wrong? Do you feel like there's just something off with life?' and I was stunned by how many people said the same thing." Boler adds that "Haircut" is also about inertia, about being stuck in our disconnectedness, which first might strike one as odd, foolish even, since our smart phones, our tablets, our computers, our search-engine-infused glasses, our TVs that we can wave at to change the channels have connected us now more than ever. "The inertia part is that I feel that people are stuck, and I see that in almost everything – I think technology fosters stuckedness," he says, laughing at the absurdity of our stuckedness. "I don't worry so much – there's this thought, that computers might become human – I don't worry so much about that as I worry about the fact that humans are starting to think like computers, a linear-process-driven creativity." But this isn't an attack on technology specifically. "I don't want it to come up that this is totally anti-technology because it's not… Technology accelerates this kind of disconnectedness, but I think it started before that." And the notion of being disconnected, be it from ourselves, our peers, the world around us, the notion of becoming stuck in time, space, the very fabric of the universe has been one writers have grappled with before. "'Haircut' is very much an 'Alice in Wonderland' story," Boler says, reveling in the company of the disconnected, the ones who've fallen down the rabbit hole before. "What I'm hoping is the Wonderland the narrator finds himself in is actually our reality. "What I want this to be is an alive and transformative experience for the audience." Local actor and musician Justin Moyar is playing the role of Boler's nameless protagonist-narrator. Scott Frisina, Camille Jones, Karen Schelinski, John Stockhausen, and Leslie Ford – who's also the play's director – round out the six-person cast. The play opens the weekend of Friday July 12 at the Renaissance Theatre, located at 1001 State St., and continues its run the next following two weekends, closing July 28. Friday and Saturday performances are at 7:30 p.m. and Sunday matinees are at 2:30. General admissions tickets are $12. Ben Speggen can be contacted at bSpeggen@ErieReader.com, and you can follow him on Twitter @ERBenSpeggen.